(NaturalNews) Hold that muffin or danish and grab a handful of almonds if you need a snack between meals. Maybe you won't feel as satisfied afterward, but if you care about your heart health, get used to it. A recent study published in the Journal of the American Heart Association provided strong evidence that incorporating almonds as snacks instead of pastries in an otherwise healthy diet provides protection against heart disease, obesity and metabolic syndrome, a precursor to diabetes. The study at Penn State University was large and long, with 52 participants over a 12-week period, according to the Penn State press release. But the study abstract states 48 study participants. So this article will go with the 48 figure. The participants were all middle aged, overweight, and had high overall HDL and LDL cholesterol readings. But none were suffering from any particular malady, so they were all considered healthy. The study was not blind of course. Too hard to do with foods. But the randomized, controlled 12-week period had a crossover at six weeks with a two-week washout period between the two six-week periods of daily observation. So actually the trial lasted 14 weeks. Apparently, the participants were divided into two groups, one using muffins for snacks and the other using 1.5 ounces of almonds, around a handful, for six weeks. Then after the two-week washout period to remove residual effects from the first six weeks, the two groups switched snacks. The overall diet was the same regarding amounts of saturated fats, and caloric intake was measured according to individual needs. The muffins and almonds each had the same caloric content, so calories were never an issue. The participants were monitored daily. Obviously, the control diet in this case was the high-refined-carbohydrate muffin diet. "Our research found that substituting almonds for a high-carbohydrate snack improved numerous heart health risk factors, including the new finding that eating almonds reduced belly fat," said Claire Berryman, PhD, the lead researcher of the study. "Choosing almonds as a snack may be a simple way to help fight the onset of metabolic and cardiovascular diseases." The Penn State study determined that, although weight remained virtually the same with either snack diet, the almond snackers experienced reduced total abdominal mass, abdominal fat mass and waist circumference compared to the muffin snackers. Increased belly fat and waist circumference are considered risk factors for metabolic syndrome and cardiovascular disease. Belly fat is visceral or adipose fat, which actually acts almost like an organ excreting various chemicals into one's bloodstream. Visceral fat surrounds organs in the stomach cavity and pumps out hormones that can increase the risk of cardiovascular disease, decrease cells' sensitivity to insulin and increase blood pressure. Decreased insulin sensitivity creates insulin resistance, where the pancreatic hormone that produces insulin is sufficient, but the muscle and liver cells don't adequately respond and glucose levels rise in the blood (i.e., high blood sugar leading to metabolic disorder and diabetes). 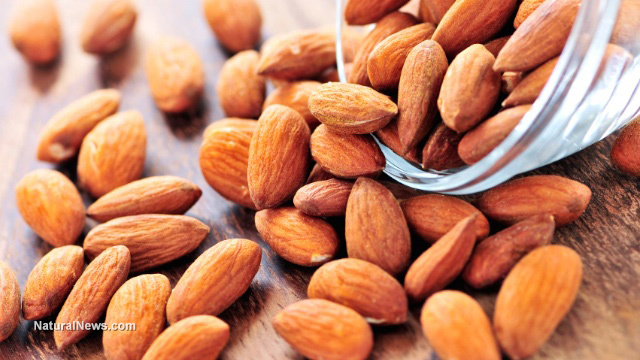 The Penn State study discovered that six weeks of 1.5 ounces of daily almond snacks in lieu of sweets improved LDL/HDL ratios from baseline and reduced apoliprotein B more than the control diet, which increased C-reactive protein, an inflammation marker, while no increase in this marker was observed with the almond snack group. As you may know from other articles, more and more cardiologists are realizing arterial inflammation is the source of heart disease. Other studies have determined the health merits of almonds, but the one covered in this article was the largest randomized controlled clinical study thus far. An earlier large epidemiological British study determined that there are similar health benefits from all types of tree nuts. The problem with almonds is that most domestic almonds are pasteurized with toxic propylene oxide (PPO), carcinogenic gas, thanks to our GMO-friendly USDA. Organic almonds are steam-treated. Imported nuts, farmers' market and roadside stands usually get away without either form of pasteurization.